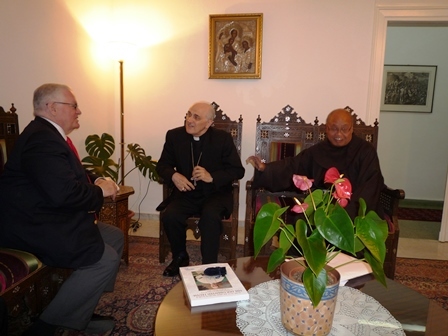 PTWF President Gary Krupp, pledges our continuous support to achieve a successful conclusion to the bi-lateral negotiations to Apostolic Nuncio to Israel, Archbishop Giuseppe Lazarotto. Accompanying Mr. Krupp is PTWF representative to Israel Fr. Angelo Ison.